A chainsaw is only as good as your ability to use it. 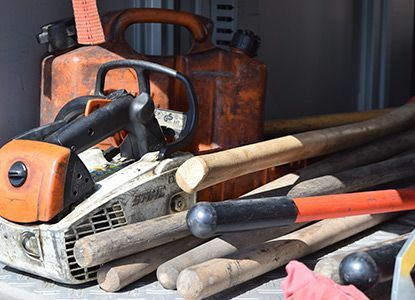 If your chainsaw won’t idle and requires constant restarting a simple trim can end up taking all day – and even worse if you are working on a commercial job! 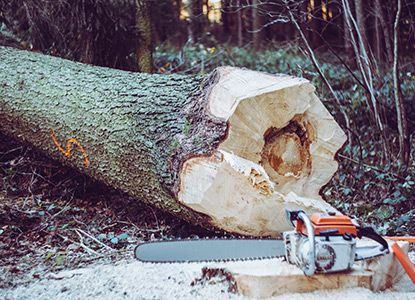 There are a few reasons why your chainsaw might not be idling. Most of the problems are maintenance related and can be fixed with a little elbow grease and a few common tools. Sometimes the problem is mechanical and needs to be repaired by a pro or even replaced if the costs are too high! The first step is to try and isolate the problem part. 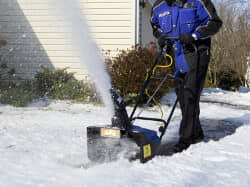 Typically when small gas powered lawn equipment has a problem it can be traced back to one part. Rarely do chainsaws experience total system failure! The first place to check is the gas tank. If you are running low on gas it might not be a problem with your idle! There may be just enough fuel left in the tank to start the engine and run it for a few cuts before it dies, making it look like your having problems idling! Unscrew the gas and double check you can see some gas. We recommend always topping of your tank before any job! A steady supply of fresh, clean air is required for any internal combustion engine to run. If your air filters are dirty and have not been changed in a few seasons your engine might not be receiving enough oxygen to stay “on”. Don’t worry – this one is an easy fix! All you need to do is clean your filter! To clean the filter pull off the cover and blast away any clipping with a can of compressed air. If any big pieces remain you may have to knock them loose with a small screw driver. Sometimes your probelms is as simple as too much use in the sun! 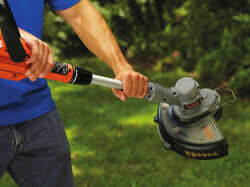 Gas powered lawn equipment can get well over 100 degrees after a few hours of steady usage. Try leaving your equipment under a tree or in the garage and letting it cool off! Another common cause of idling problems is problems with the Carburetor. If dirt, clippings or other gunk gets into the carb or its connections to the engine your engine could start randomly switching off – even while idling. While you have the carb taken apart be sure to check the needle – even a speck of dirt can cause problems! Gas engines need air to work properly. If your chainsaw has been sitting in the shed collecting dust or gets heavy use you may have debris blocking air intakes. Inspect the body for dust, spider webs, grass clipping, leaves and other things that might be blocking the airflow. Knock them clear with a flat head screw driver or can of compressed air. Can’t figure out what is wrong? Always make sure to use the right blend of gas to oil or you might find yourself in the market for a new chain saw! If you use the wrong blend it might run for awhile before it dies! Most chainsaws have an adjustable idle speed. First start your saw and let it run for a few minutes – if it lasts that long. Try turning the dial up and down, then restarting your saw. If you have a high and low speed settings adjust both and see if you can find a setting that works! This process may take some time to find the “perfect” setting and be careful – this might void your warranty! Modern tools come with all kinds of safety devices. 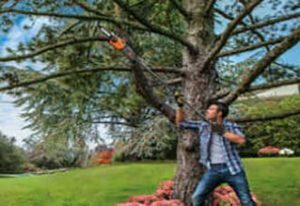 Make sure you are not accidentally letting go of the safety – causing the chainsaw to shut off. After checking it is not human error try checking the circuits around the safety – if you see loose or corroded wiring you might have found your problem!